Dr. F.G. Hochberg is a Curator Emeritus at the Santa Barbara Museum of Natural History. Eric has been printing natural subjects for over 45 years. In 1976 he co-founded the Nature Printing Society. Eric has lectured extensively on the history and techniques of nature printing and taught numerous printmaking workshops in North America, Australia, Europe, and Asia. His art has been exhibited in numerous solo and group shows and he has curated and organized a number of major, multi-artist, museum exhibitions of nature prints. In 1985 he was selected for a Science and Humanities Scholarship which enabled him to spend a year as an “Artist-in-Residence” at the Museum of Victoria in Melbourne, Australia. During the year he prepared a portfolio of prints of Australian plants and animals for the Museum. Eric’s studies capture and isolate in space the elegant and delicate beauty of nature. The works presented here have been selected to demonstrate a wide range of subjects and techniques used to create images of nature. Shane & Genny Anderson were first introduced to the art of nature printing in 1975 when they took a workshop from Eric Hochberg at the Santa Barbara Museum of Natural History. Since that initial course, in the “direct” method of fish printing (gyotaku), they both have been captivated with the art form. 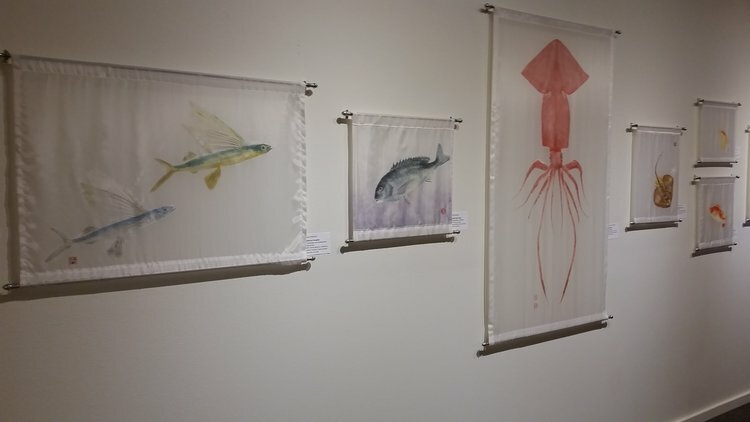 After a few years of working with the “direct” method they began to do most of their prints in the “indirect” method of gyotaku. Today most of their works are printed on fabrics. They continue to enjoy taking nature printing classes and expanding their never ending list of subjects to print. Most marine animals they tackle for printing are large and typically require them to print together. Shane worked as Collector/Naturalist in the Biological Sciences Department at the University of California, Santa Barbara for 37 years and is now enjoying retirement. Genny taught Marine Biology at Santa Barbara City College for 37 years and is now a Professor Emeritus.